It has been a great month for Vanco. Since publishing some very respectable half-year results late in September, Vanco has entered Gartner’s Magic Quadrant for Pan-European NSPs. Its “asset light” VNO model is beginning to show some fabulous returns, according to its CEO and founder Allen Timpany. 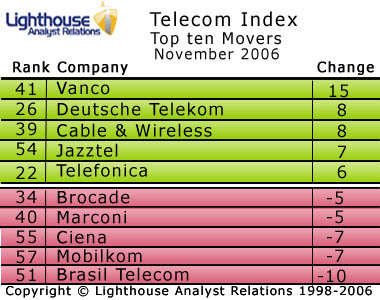 Of course, this is not the only reason Vanco rose a staggering 15 spots in our Telecoms Index. Furthermore, Vanco only just missed a placing in the top forty. Another big winner this month was Deutsche Telekom which managed to replace a five spot fall last month with an eight spot gain this month. They are presently 26 in the rankings. Cable & Wireless was also up, as was Jazztell. Telefónica also entered the top 25 this month. Brasil Telecom has slid ten spots finishing in 51st position, which is still creditable. Mobilkom tumbled seven places down the rankings which is slightly worse than last month’s poor performance. It is now 57th in the rankings. Ciena has fallen by seven spots too while Qwest has dropped out of the top 25 altogether.